At Abalina Cottages we take pride in offering boutique accommodation at an affordable price. There is no better place for luxury and convenience this close to Bright township. 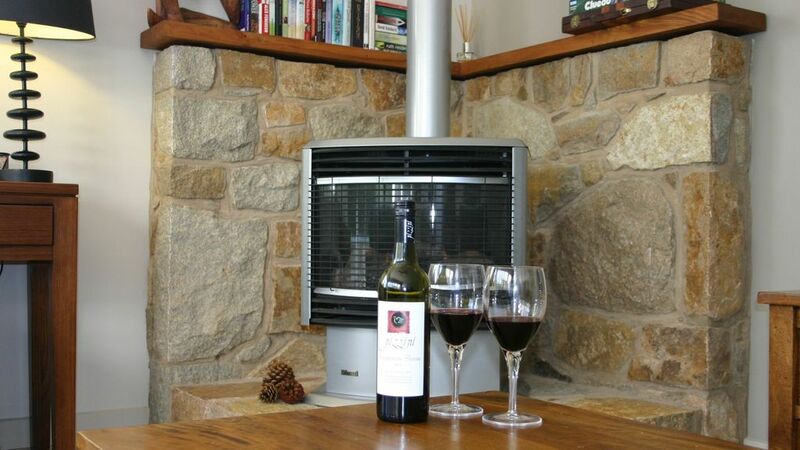 This spacious self-contained cottage, with a modern kitchen and with a luxurious gas wood fire. This property sleeps up to 6 guests with 3 bedrooms and 2 bathrooms. Our cottages are spacious enough to suit the family but with an intimate feel for a romantic couples getaway. A holiday in Bright is best staying close to the township and Abalina Cottages are a mere 600m walk to town. Stroll in minutes to the cafes and restaurants of Bright’s vibrant main street, that’s the Abalina Cottages lifestyle. Back at home it’s the extras that set Abalina Cottages apart. We want you to always feel at home so each cottage is equipped with creature comforts that add that special touch. From the bathrobes, dvds, books and games to the kitchen stocked with often forgotten day to day essentials, you will want for nothing on your stay. Its the extras that set abalina cottages apart. From the robes, dvds, books and games, to the herbs/ spices, flour, oil, jams and selections of coffee, you will want for nothing. BOOK WITH CONFIDENCE over 800 guests have given abalina cottages a 98% "Guest Satisfaction" rating (including 99% for cleanliness) and 99% "Service" rating on the RACV website. abalina cottages is also rated as "excellent" on Trip Advisor from 80 reviews. * 1 king bed and 2 queen beds. A porta cot, high chair and baby bath are included in the infant/children's rate but bring your own linen, pillow and quilt. Plastic plates and cups provided as well as DVDs. We provide a litre of milk, butter, 2 jams, vegemite and honey. Just bring a loaf of bread and your favourite cereal and you have your breakfast set. Check in after 3pm and check out before 10.30am 4 nights or under and 10am 5 nights and over. Multiple cottages - one cottage must be vacated by 10am. Earlier check-in may be available with no additional charge depending on bookings. wall oven with hot plate. Well appointed cottage in a great location close to the town centre. The cottage is very spacious and well appointed. It's a very easy walk to shops, restaurants and cafe's. Ideal place to stay for couples traveling together. Would happily recommend and would stay there again.